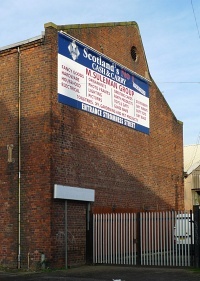 Client: Robert Maclaren & Co.
Honeyman, Keppie & Mackintosh designed several additions to this foundry, which specialised in the manufacture of cast-iron pipes for water and gas mains. Their work included a new Machine Shop, Blower House and Foundry Pit. Current name: M. Suleman & Co.
1: The Hunterian, University of Glasgow: GLAHA 52340 (M205-001).